A special ‘Listen local’ post from the road, as I’ll be passing through Indiana tomorrow. Whisper Down is a Terre Haute-based folk/alternative band (they cite influences from The Smiths through Death Cab for Cutie through Tracy Chapman). Like Sloan, they share songwriting and vocal duties. Check them out if you’re in the area. zed equals zee goes west! zed equals zee is heading west! We’re relocating to Seattle for a year. This blog will still focus on local music – it’ll just be a different version of local. So you have a favourite Seattle band, or are in a Seattle band, please tell us about it in the comments! And if you are a Boston band – say, one of these bands – I’d love it if you followed Freezepop‘s example and do a West Coast tour. Also note that updating will be spotty this week, during the move. But stay tuned! 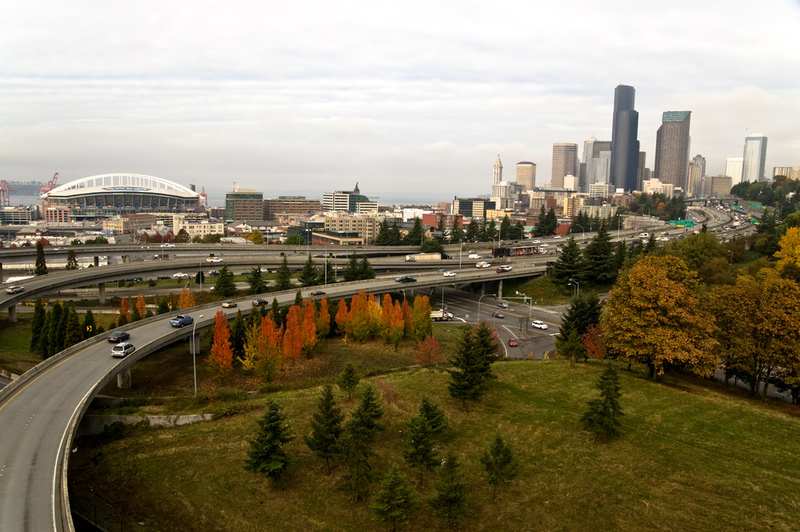 Image: Freeway Curves by Flickr user Slightlynorth, reposted here under its Creative Commons license. Three fantasias which have real public radio personalities as the subject. 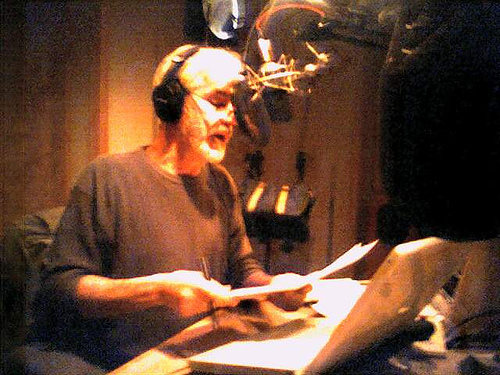 First, Amanda Palmer tells the story of her unrequited crush on Christopher Lydon (pictured above), former host of The Connection on NPR’s Boston affiliate, WBUR. Next, Jonathan Coulton‘s ode to WNYC host Soterios Johnson‘s secret E- and Red Bull-fueled club lifestyle. Finally, Franz Ferdinand fantasize about being interviewed by Terry Wogan, BBC Radio 2’s legendary morning radio show host. I think that Sunday’s highlight was Cut Copy, despite everything. They were delayed at the airport and ended up doing an abbreviated set that conflicted with the headliners, Spoon. While the real diehards waited it out through Mike Reed‘s ‘psychedelic doo-wop stylings,’ the rest of us (like me and my friend Jon) headed over to catch the Spoon set, keeping one ear out for the sounds of joyful electropop from the Balance Stage. We returned to immerse ourselves in the mass of dancing indie fans and catch the last couple of songs – it was a great close-out to the fest. And short but intense wins again. How did I ever forget how much I love Jarvis Cocker, the charismatic former frontman and principal of Pulp, especially since he wrote one of my favourite songs of all time? (“Common People,” off the 1995 album Different Class.) His self-titled solo album came out in 2006, and he played a set at the Pitchfork Music Festival on Saturday night. The standout song was the as-yet-unrecorded “Girls Like It Too”. Cocker introduced it as being based on a line from a reassuring letter that John Peel wrote to his brother as he (the brother) was just becoming sexually aware, which was read aloud at Peel’s funeral in 2004. (The YouTube video, above, is from the March 2008 premiere of the song in Buenos Aires.) And in a typically classy note, Cocker’s encore was the 1987 track “Face It” by Master C & J, a shoutout to Chicago as the birthplace of house. (thanks to Erich for helping me identify the artist). I’m not going to comprehensively blog the 2008 Pitchfork Music Festival; instead I’ll point you here and here and here (and I’m sure you’ll find others, if you’re interested). Rather, I’m just going to focus on one artist from each day. Unsurprisingly, Mission of Burma was my personal highlight from Friday, playing their album Vs as part of the All Tomorrow’s Parties ‘Don’t Look Back’ series. The played a few non-Vs tracks to start (so that fans would have the ‘definitive edition’) and, as always, they were ferocious and compelling live. As that comment suggests, they also had a signal sense of humour about the artificiality of playing an entire album, in order, including starting each ‘side’ with the sounds of crackly vinyl. The YouTube link above is of a live performance of the last track on the album, “That’s How I Escaped My Certain Fate.” I don’t know yet if Pitchfork is archiving the live video; stay tuned. The Pitchfork Music Festival has finally arrived! It kicks off at 6 pm CDT tonight with z=z local heroes Mission of Burma, performing their album Vs. in its entirety. If you’re not able to attend, the entire festival is being webcast. Given the high potential for a Midwestern version of a Glastonbury-style mudfest – the forecast is for thunderstorms all three days – that might be the best way to experience the concert. No word on whether the vids will be archived for your later enjoyment. You are currently browsing the zed equals zee blog archives for July, 2008.